This recipe comes from One Potato, Two Potato by Roy Finamore. His volumous text entices us potato lovers with over 500 glorious potato recipes. The picture was taken by me as usual. Oh yeah, and I gotta admit here. I just do this all in the food processor like normal biscuits. Just remember to bake the sweet potato ahead of time. Stir the flour, baking soda, baking powder and ½ teaspoon of salt with a fork in a mixing bowl. Drop in the butter and toss it in the flour, then cut it into pieces. Work the butter into the flour until it resembles oatmeal. Whip the sweet potato with a fork until it's very smooth. Then add it to the bowl. Work it in lightly but thoroughly with your fingers. Add ½ cup buttermilk and stir. Add just enough buttermilk to make a smooth and only slightly sticky dough. Dump the dough onto a floured surface and knead it two or three times. Flatten it out to ½ inch thick. Cut out biscuits with a 2 ½ inch cutter. Put on a parchment covered baking sheet. Gather the scraps together, pat down, and cut out more biscuits. 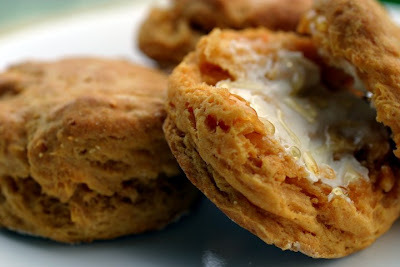 Brush the biscuits with buttermilk and bake for about 15 minutes until well risen and appealingly brown. Serve hot. welcome to blogging. great work!!! Thank you! I am so glad to see you Bee! That is the tastiest looking biscuit I have ever laid eyes on. These look awesome! My favorite restaurant here in Nashville has sweet potato biscuits. I almost always order them! Your recipe looks SO yummy, I'll have to try it!